Nokia’s Athens May 17th event is just for “local launch of E6 and X7”. Earlier today wes? found a tweet from @cmahr who works at Nokia, saying that the May 17th Nokia event is just a local thing to launch X7, E6 and Symbian Anna. 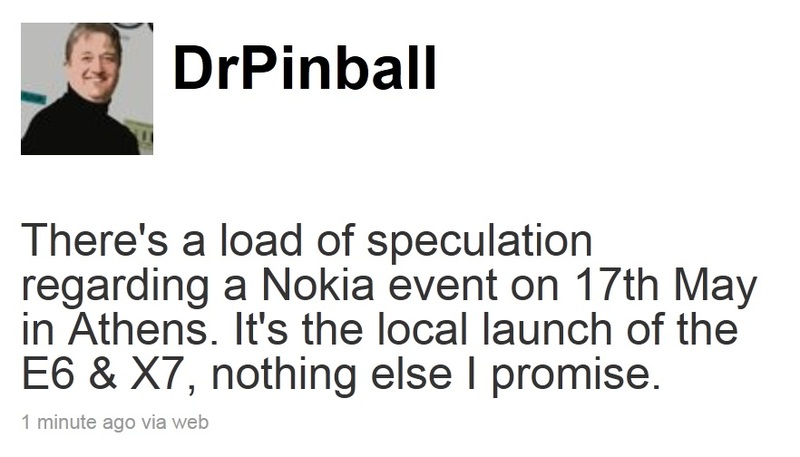 Nokia’s Comms Director, Mark Squires says “There’s a load of speculation regarding a Nokia event on 17th May in Athens. It’s the local launch of the E6 and X7, nothing else I promise”. Tin foil conspiracy hats on; are they just playing this down because something actually is going to happen and they’re trying to keep suspicion/expectation down? Or, is there really nothing to this event. Why the need for a local launch? By launch, is this when it’s available for sale no? What about Anna’s availability? Is this the date for PR2.0?